Now you can address all your Questions, Doubts, Feedback or anything at all (related to Bipolar Disorder or Depression, of course!). If you don’t have an Account, Log in to DISCUS with your Facebook or Google Account. Its as simple as that! Firstly, by clearing your doubts, you get the required information. At many times you might have been misinformed: here’s your opportunity to benefit from clarity. Secondly, all the doubts raised and resolved build a rich reservoir of knowledge and learning for the Community. Help yourself, help the community. There’s one more exciting way to keep in touch now! 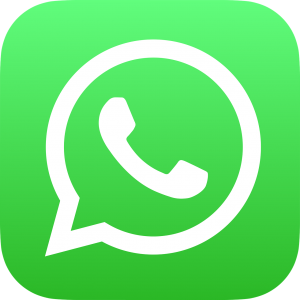 Be a part of our WhatsApp based Peer Support Group which has pan India members. All discussions in it are kept confidential. A Group drawn from among patients, caregivers and our panelist Medical Professionals. Share your Mobile no. and name in the comments section so that we can add you to this fast evolving community. Login to DISQUS for comments. Since a week I am feeling very irrated to even for simple & silly things. are impatient: by themselves these may not conclusively signify any psychiatric illness. Sure, Bipolars tend to be irritable and impulsive. The level of irritability also fluctuates with moods. Unless you have been specifically diagnosed as a Bipolar by a Psychiatrist, these could be the symptoms of stress or an emotional upheaval too. Get advice of an efficient Psychiatrist, have your condition diagnosed and if necessary, treatment would be called for. What is your Doctor’s assessment (if you have seen one)? Please share that for me to address your query more specifically. Apart from the medical treatment, what has helped maintain my peace of mind is yoga, meditation, spiritual pursuit and regular exercise. I am astonished to note that during Last month, I had severe Depression & Dr. told it as Bipolar ll. I met 3 more Psychiatrists but No one inform me the Diagnosis & prescribe Medicines as per current symptoms. I am Confused as whom to follow ? Firstly, I thank you for being among the first Bipolars (from India) to come clean about your Bipolar condition. I know it needs courage to step into the open without masking your identity: I commend your conviction: is it the first sign of the Bipolar Community opening up in India, bit by bit? We enter a brave new era..
That’s what this site was set up for in the first place. Coming to your question itself, it is rare but not unusual that Psychiatrists withhold vital information from mental illness patients. Due to such inconsistency in treatment and diagnosis, it is of great importance to seek an opinion of a Psychiatrist who is recommended by those who have actually been treated by her or him. Another way to possibly ensure this is to consult one who is affiliated to a reputed Hospital. If you are confident about the treatment by one Doctor there is very little reason to consult three others. It would only confuse you further and your troubled mind cannot afford that. ONLY A QUALIFIED PSYCHIATRIST CAN DIAGNOSE YOUR CONDITION and prescribe treatment. Do get back to me if you have further doubts. A: Many such myths exist, @J.K.GOYEL. The main reason is due to lack of awareness. It is shocking how such serious issues can be left to chance..
None of the research that I have conducted suggests that marriage relieves Mental Illness conditions. 1) Does the prospective bride know about the condition? If yes, a joint pre-marital counseling session can help create a stable relationship. Is the Groom responding well to treatment (that is, if he’s being treated at all)? 2) If the bride is kept in the dark, it is not only morally wrong to do so, it would ensure tremendous friction when the truth eventually surfaces and might result in a split. 3) The pressure of raising a family can actually be a burden a troubled mind might not be able to cope with.. Thanks for mentioning the blog I wrote. I do a lot for bipolar disorder internationally and look to help outlets for information, hope and care anyway I can. If there is anyway I can do something to help with your blog just ask. I am traveling extensively this year and ned next behind my book but will not be near India, so most of what I can do will have to be remotely done. You are doing great work and I look forward to speaking with you. Not crediting an Author for his work is a sign of insecurity (and plain theft of intellectual property):- of course, I had to mention you for your inspiring post! Thank you for your appreciation of this community, Eric: while awareness and advocacy of Mental Health is widely prevalent in the West, we in India are way behind on this front. The stigma is overwhelming. I aim to step up the activity to offline meetings too. People like us who are ‘advocates’ of Mental wellness, need to build synergies to amplify the reach of our work. I’ll keep your generous offer in mind. Thank you running this website. 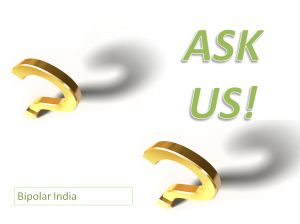 I came across your website while searching for communities in India to dealer with Bipolar Disorder. My Mother has been dealing with Bipolar for close to 30 years now and I have seen her struggle with very closely. I have seen her wriggling in her bed due to the side effects the medications induce in her, but she has always been the amazing resilient in recovering every time an episode strikes. We live in Bangalore and have visited my psychiatrists and are currently seeing one such Doctor and fortunately the medicines have brought down the frequency and the intensitiy of recurrence quite dramatically, but as you know, every occurence is hugely stressful time for the immediately family let alone the sufferers themselves. I was reading about what we can do to make my Mother’s life easier and I came across several Herbal remedies that claim to work wonders. mainly Gingko Biloba, Passion Flower, Fish Oil, Flaxseed Oil. Have you tried any of those or other such alternate remedies as part of your treatment.? I am an eighteen years old girl. Since my childhood, I always had a kind of imbalance with my behaviour. After every four or five days I would get into the same erratic sad dark cycle and it would carry on three four days or even a week sometimes untill I felt some motivation again and got back to doing something. I’ve felt ashamed of myself for being so lazy, being in bed, being rude with my mother, fantasizing day in and day out. I used to cry and cry and feel guilty for being such a horrible person. I would procrastinate things unrealistically high for myself and set up myself in too good situations and just think and think. I think I do this to get away from my reality and sadness. I’ve also had problem with eating. I eat a lot when I want to fill the emptiness or suppress the fear of failure. I think I have been extremely sensitive. My ego is mile high. I used to ask my mother indirectly but she always said that be strong and increase your willpower, everybody feels the same pressure of studies and same sadness, don’t run from hard work. But after 10th class, I couldn’t control myself. I indulged in erratically ungraceful things and I got out of control. I would remain in bed for almost 16 hours a day. I would speak too much too loud, exaggerated expressions. I thought I would get out of it but I couldn’t. Yes, I got the periodical high exciting motivation but it didn’t last longer. I’ve always been good in studies (above average) but now I’ve messed up my 12th result for which I had been dreaming about so much. Infact on my bord exam day I was sleeping (didn’t take a bath for the whole winters) and got up at the end moment, went to school reluctantly with no energy and I didn’t even want to attempt my exam. I have been obsessed with dying too. I feel like if I can’t change something in my life then I should rather die. I would shout at my mother and family. I even got into a big hand fight with a girl in my class. I’ve been around boys a lot. I didn’t want all of these still I pushed myself into these. I just only want to know whether I have this bipolar disorder or am I just finding out ways to excuse myself from the burden and tension of life? AM I lazy or does it have something to do with bipolar?? I feel like I want to blame something else or someone else to take all of the blame for my reckless behaviour. People ask me “are u alright, you were such a brilliant girl in tenth? What happened?” They give me all sorts of advice, yes I used to feel a little motivated but now their talks too aren’t helping I feel like what’s the use if I’d be going back to that same vicious cycle. sir from india suffered from bipolar ,i had broke up a relation with close friend because my symptoms pls help how to get back the freind. i am taking lithium tablets from 8 months now better .i had episode of depression & 1 manian total 1+1 =2yrs .but lucky to identify soon . life together as happy as possible. Could you please suggest what I can do because sometimes I get completely taken off guard by her and react with sarcasm or anger which doesn’t help her at all. Its me(25),my dad(59) and mom(52). My dad a serviceman on the verge of retirement, me an IT employee(based out of home currently, but planning to get back home in a month) and my mom,the homemaker. Our family is based in Kolkata. Let me tell you that its my mom who is a victim of BPD. Its been eating her up for last 15+ years. Lack of social awareness , support and guidance made us succumb to the drug crazy psychiatrists which made her vulnerable over time. Let me tell you that its been a tough journey for our our family to thrive under such condition but we did good. I am hopeful that you will be able to help me with your valuable insight on this. 1. Do you have any recommendation on psychiatrists based in Kolkata? 2. Are you aware of any support group, the same city(I want my mom to communicate in her mother tongue, that way views are expressed at best)? 3. If you have any other recommendation on visiting similar places outside Kolkata? 4. We have already tried sessions of Art Of Living but din’t work out. You have anything more effective in mind of this sort? Thank you @sayantabasak:disqus , for reaching out to us. Am glad you find the posts on this site informative and inspiring. From what I understand, your mother might have had some nasty experience with psychiatric treatment. To my knowledge (and from experience), there is simply no escaping Psychiatric treatment to bring a patient to near normalcy and this might be a lifetime of treatment. One HAS to accept this fact. I am glad I switched Doctors and hung on. Am into my twelfth year of my journey now. please ensure they are experienced and have an MD in Psychiatry degree. 3) Support Groups are rare anywhere in India (have a vague idea of a new one in Bangalore).Have not heard of any in Kolkota. We are starting our Support Meets this month itself in Mumbai. 4) Yoga and Meditation have worked wonders for me! But, I suggest that in the first place, your mother’s mind has to be in a receptive state to fully benefit from these: that is why treatment first and foremost. There are many online resources for these. that is the best shot you have at seeing your mother happy. You mean any place in specific? I am writing on behalf of my sister. She was diagnosed with bi-polar at the age of 20. She is almost 33 years now. She is married and has a kid. She has been under medication for so many years. And she has tried so many psychiatrists in Kerala. Her condition is getting worse. She refuses to take medication, we give her without her knowledge. Will holistic medicine help/in addition to taking regular tablets. Are there any holistic healing centres in Kerala. Hi Almira , thanks for writing to us. That your sister refuses to take medication and is surreptitiously being treated indicates that perhaps because of her lack of recovery has made her lose faith in medicine/treatment. Is she uncooperative? For holistic treatment to work, she has to be very much involved in the process. Certainly, Yoga, Meditation and other supporting regimen help~ I can personally vouch for that (now science also backs it with evidence). In my opinion, for these to work, she must regain a semblance of normalcy by participating in the treatment~ else it is a challenge. It also depends whether she is a Bipolar Type I or II. Depression (usually resistant to treatment), in type II can be managed by above methods.Also, have you tried Psychotherapy/ Counseling? since I am Mumbai based, I have no first hand info about credibility of any such centres in Kerala. However, your State is the home of Ayurvedic Treatment~ you could find out from your physician. I’ve created an account with discus, but can’t seem to find a discussion on bi-polar and mood disorders. I’m not sure how to start here either. I am stuck in this ‘black dog’ phase since the past two to three years, under medication, did some therapy, but can’t seem to get back on track. I tend to blame my ‘fate’ for disappointments, slowly learning to be persistent, and keep trying. But I’ve lost myself. From having a fantastic job, loads of friends, a nice car, slightly turbulent relationships, there’s nothing left. Not denying my family’s support but they’re all disturbed in some way or the other. People are slightly surprised at how many of us in this family have a dysfunctional lifestyle and relationships. @disqus_lE9xXcyWPu:disqus, firstly, keep the faith and I’m not saying that to just calm you down. False hopes mean little. I’m a bipolar type II since 14 years. This type of bipolar brings with it severe and prolonged phases of depression. I have seen the darkest of times but I can say this with some satisfaction that I am among the happier people in the world. I can empathise with your situation because at that time, recovery seems unlikely. Sure, you should be able to have a steady relationship as well as find means to support yourself financially: I’m happily married and have a daughter, I support my family too. Have faith in God and above all, in yourself. He has gifted you with incredible healing powers, have faith in them: always! You certainly are justified in wanting to live joyfully. Isn’t that what life is about? Where do you live: maybe I could help you in providing you with info re: support available. So I got a dream job and decent salary. My day starts at 6 am and ends at 8:30 pm and I’m very happy about it, no doubt, because I have all the focus. The only issue I face is, to get back to a routine job after a break of 3 years and waking up early is a first for me. The medicines I take have kept me pretty balanced, however, I had the first nervous attack since I joined because even though I woke up at 6, I was so sleepy, not in the normal way how everyone is, but sleepy like drugged, which makes sense, because I do take sleep medications. I’m writing, because I just freaked out, and wanted to hide myself under a blanket, until I told myself that irrespective of anything, I will inform my boss, and do the afternoon shift instead of taking an off in the first week! I feel like the solution would be to cut down on the dosage of the sleeping pill, and not delay my doctor’s visit. Who knew even the slightest imbalances in the chemicals of one’s brain can create so much havoc! It’s like your mind shuts and you’re trapped in complete guilt. I will go to work today. They say half the job is just showing up. My heart goes out to all you people who face this challenge on a daily basis. We just have to be true to ourselves. And keep trying. @disqus_lE9xXcyWPu:disqus, your attitude to your condition is ‘just what the Doc ordered’, as the cliche goes! Since yours is a fairly recent affliction (by bipolar standards), it takes time to adjust to the new reality. I’ve noticed that I’m at maybe 40% of my earlier energy levels~ what I’ve also learnt is that I’ve managed to use my resources better, forced by the circumstances. Yes, waking up is a bugbear in depressive phases but I’d suggest that you tinker with dosages only after seeing your Doc. About chemical imbalances, that is an understatement~ the malaise is deeper. A post on that, I promise. Yoga and Exercise also helps. I am sure that with time, your body clock will adjust, as I have managed. Yes, life is a challenge now, but after 14 years of BP2 I can gladly say, I’m smiling! Also, I would love to contribute articles for the website if possible. Please let me know at [email protected]. If you are on FB, you could connect to me, I’ll give you all the details. I am glad that such a group exists and also provides a platform for one to reach out to people who understand this problem. A bit about my BPD 2, I have had episodes and symptoms since 2005, but only got diagnosed in 2010. Now till 2015, I had stopped my medications twice which led to major depressive episodes. The current being the worst,which started 3 weeks ago, triggered by moving on from the previous job and deciding to put on hold a startup I was working on. I have been taking medications again and also on homeopathy medicines. Its been working well. My struggles have been of accepting the my condition, and also changing career path often in the last 6 years I feel have put me on the backfoot, and often find family don’t quite understand the problem. It is also very stifiling, that I cannot speak about my condition about to many people for the fear of being ridicule and using it as an excuse. I am 28, and there is the pressure of settling down and getting married, which is scary because sometimes I do not even understand myself. Off late, I have been doing some yoga, meditation and exercising. Also, have started reading the Bhagvad Gita, which is beautiful. I am looking to reach to out some to share my feelings, and also gain perspective about different aspects of my life from BD people. 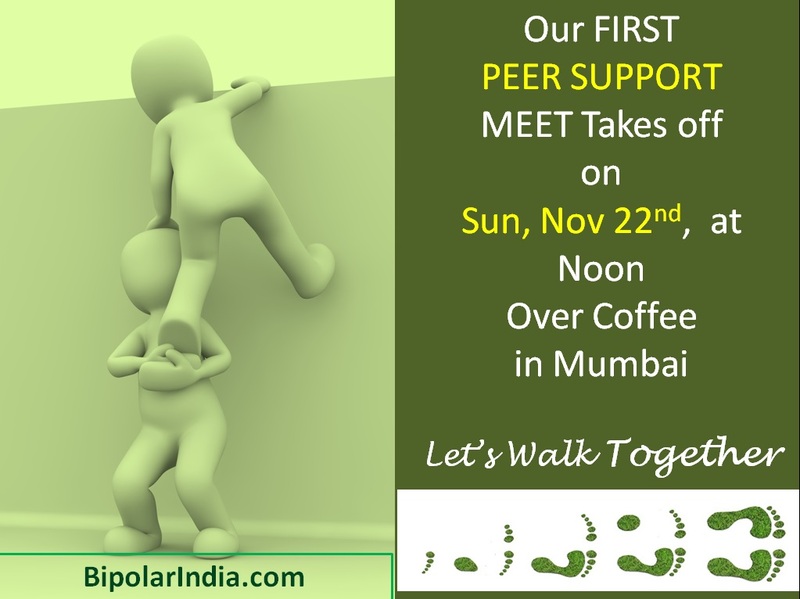 “Let’s Walk Together”, we are going to announce Offline meetings for Peer Support where Bipolar, depression afflicted can interact openly, without fear and in an interactive format. We learn from each others’ solutions and bravery. By adopting holistic healing methods, you are on the right path~ that’s what helps me in my own BD 2 fight back. However, I have never shown indiscipline in matters of my medicine. Acceptance is the bedrock of healing. Yes, the Bhagavad Gita is a great source of Wisdom and hope. I’d say, perseverance pays in the long run, no matter what the odds are. Hi , I am PHANI and new to this community. My first post. Bipolar, obviously , diagnosed in 2012. Feeling special and great in fact but a little confused and I am real thirsty for the knowledge on BPD. Are are support groups in various cities in India? For that matter, I am from hyderabad. Can you share the information about any such group if it exists. Do they meet regularly, as in person to person directly ? Can you suggest me some top 3 books which explain the best ways to handle BPD ? @phanimkms:disqus apologies for belated reply. In Mumbai, we announced a Support Group for offline meets but people aren’t responding yet. About Books on Bipolar and Depression, one I have personally read is Feeling Good by Dr David Burns. I look forward to your continued participation on this forum. NB~ You could contact @disqus_B9DoIP21Ga:disqus in Hyderabad. I’m a spouse of someone who sufferes with biopolar 2 …my husband is currently suffering through a case of mild depression (he has had a hypomanic episode 3 months back) I have been reading that biopolar two can have severe depression. I want my husband to have access to support groups…how can that be possible? Yes, it is true that BD2 is characterised by severe and prolonged episodes of depression and hypomania. At times hypomania can trigger an episode of full blown mania also (I have experienced all these phases). What you need to know to begin with is that while Bipolar is said to be incurable, with treatment and discipline on patient’s part, it can be managed successfully. Many are leading active and healthy lifestyles. About Support Groups, where do you stay? In Mumbai. we intend to begin Offline Peer Support Meets on a monthly basis. I had even convened a meet but met with no response. Those afflicted and their families must realise that by stepping out into the open, interacting with fellow bipolars (and care givers, which is also part of the plan), we create a platform for recovery. Support Groups have been operating with great results in the developed world~ we must step up here too. Thanks Vijay. I agree a support group is a great idea and we can step up. We stay in Santacruz and if there is one here we’ll join. Thanks also for all the additonal information ..we will be visiting a doctor soon and i think medications should work well. Also we are continuing yoga and other forms of exercise. That’s what we are here for~ to spread awareness and offer support to best of our ability. Yes! Medicines and even counseling/therapy will help. they are very popular in developed nations because of their effectiveness. Let us slate one post Diwali? Since you are in Mumbai, it would make things easy. Meanwhile, a very Happy Diwali!! Happy Diwali to you too. Yes the week after diwali (around the week of 23rd) works best. Happy to encourage this forum – I do think it’s important. So, @disqus_NJC30evDYq:disqus tell me which day of coming weeks suits you best~ please provide me options and we can get this started off~ we could begin even with a one on one meeting. The key is to start off the process. A Monthly meet-up is ideal to keep the flow going. We could build synergies for our community. Just sent you an FB message does 25th Nov evening work? If not any day after this in the week suits us. Evenings is better. We are based in Santacruz west. Look forward to starting this off. My husband and I will be there. @disqus_NJC30evDYq:disqus, thank you for your support this initiative. Being married to a Bipolar can indeed be stressful, esp. if one’s spouse refuses to co-operate or undergo treatment. – Since how long is your husband suffering? – Is he being treated by a Psychiatrist and does he adhere to treatment with discipline? Tanuja, we might well start Peer Support Meets in Pune too, but that will take time~ after Mumbai meets take firm shape. About your husband~ whoi toh baat hain: medicines/treatment badh karne se taqleef badh jaati hain. Abhi dawaai chal raji hain woh acchi baat hain. Don’t worry! Meri case mein maine mania aur depression, dono kaa saamna kiya hai. Aaj main theek hoon. Discipline aur abar chaahiye, bas…aur, vishwaas. Aap dono meet ke liye Pune se aa sakte hain, agar pehle se date pakki ho toh? Mere kahin doston ke jpbs choot gaye is bimaari ki wajah se. What is the point in worrying about what you cannot control? Kya aap company waalo se baat kar sakti hain? Shaayad woh samjh jaayen..
Kal husband ke company se phone aaya that unone bola ki usaka behaviour normal nahi hai company meir aur o hame co operatre karenge air unone kaha hai ki aap 1–2 months chutti me lo para use normal kar do to sir an hum kya step le une normal karane me liye unaka behaviour change karane ke liye. Is sat unaka ECT hai hamare psychretrics bol rage hai ki him surf ect aur medicine denge bus baki much nahi karenge. Tanuja, it is heartening to hear that your husband’s employers are supportive and are willing to give him medical leave too. It would depend exactly how serious your husband’s case is at this moment. Is ECT really called for? I would say you can take a second opinion before undergoing ECT. Therapy by Counselor can hasten recovery. NAMI is a non-profit organisation dedicated to Mental Health. Yes, @disqus_XpsaSmpGb7:disqus, please see him before you decide on ECT. My psychiatrist insists that ECT is always the last resort where the patient is not responding at all. Sir hum Dr. Bapat sir se mil kar aaye hai. friday se sir sessions start kar rahe hai mere husband ka. 2) He believes Therapy and treatment can work equally well. Isse liye aapko bataaya tha, sabar rakhiye. Maine apne doctor we bat ki to bol rahe hai ki hamne to ECT ki treatment de Di hai is sat ek ECT hai o denge air medicines baki him khuch kar nahi sakate. Sir muze aapase yahi puchana that ki him second opinion le le kya. Ya counselling kar kar laye aur ye cognitive behaviour technique khuch kam kar sakati hai kya plz sir muze PUNE me koi acche doctor ho to bataiye. I am so glad to have finally found a site about ‘bipolar’ and ‘india’. Congratulations! My brief story: I am 48 years old. I have suffered from bipolar/ depression since 1989, so I’m running in my 26th year now. I tried doctors, drugs till 2002, and then stopped because that didn’t help me at all. Typically I alternate between a ‘normal’ period of 15-20 days and a ‘depressed’ of 10-15 days. It’s a terrible way to live, but alas! I have not been able to achieve a significantly long period of remission, and it often takes a small trigger to knock me off. My career & relationships are naturally quite poor. I am very sceptic of medicines, since they didn’t help me at all, nor have I seen others whom I know well to have benefitted from them. I am sure that this affliction is life long. I do not even believe in miracles anymore. I find such a hard nosed attitude better than an optimism that proves flaky. So, this is my story. I’m based in Gurgaon. I would love to meet fellow sufferers face to face here. Anil Chauhan, thank you for sharing your experience so honestly with us. That you have been suffering for 26 years has obviously taken a toll on your resolve. I too have been a Bipolar for approx 15 years now but trust me, my recovery was fundamentally based on medication and therapy. You must have been upset with your lack of progress which prompted you to quit meds, but that is not advisable at all. It makes one more vulnerable to the illness. I have not skipped my meds even for a single day! About swings in moods, yes, that is a hazard we have to live with..
he agreed with me Self belief was half the battle won~ thus if you give up on optimism, you are cutting your own feet. I not only believe in miracles, but I am a living miracle! And so are you..
Vijay: I should envy you for having recovered from the worst of this illness. I gave up medicines not carelessly but because they did not produce any improvement in my condition after 7-8 years of taking them. Like me there are thousands of people of other people. I have also tried meditation, courses like Sri Sri, but these also proved to be of no use. For the last 4 years, I do running. It definitely helps me, but for a brief period only. Real work, like management or leadership is what really takes out my depression, but I stumble and fall while trying to do it, and then feel terrible about it. Now I am tired of this emotional roller coaster ride, and just want to die with dignity. But in India that is not possible. @anilbp:disqus , I can connect with your pain and to a certain extent, your hopelessness. However, deep within, I at all times believed that I would regain wellness. About your quitting medication~ while treatment does not guarantee stability, it wards off extreme mood swings, that much I have experienced. From there on one has to battle with own efforts. Yoga, exercise, reading, meditation and the spiritual path which I adopted were what ultimately helped me find fulfillment. All the same, my treatment remained my foundation to recovery. Life is too precious…do not surrender to this illness: God has plans for you and me. All difficulties will pass provided we are determined enough. Vijay: Thanks once again for your reply! Your promptness in replying is the best testimony of your stable & healthy state of mind. Hopefully, I will stay in touch with you and I wish you the best in your activities and endeavours. You are welcome, @anilbp:disqus and thank you for the appreciation. We are here to offer support to the community.. If I can contribute to the recovery of any tormented person, it is a source of satisfaction for me. One thing I can assure you: there’s never a point you cannot turnaround from. Keep the faith. There’s a power who wants to see you smile again..
Vijay: I’m reading this book – Shoot the damn dog by Sally Brampton, and it is her memoir of depression. My experience of depression is very similar to hers. It is a very well written book. Omega 3 fish oil: There is a huge amount of information that strongly recommends omega 3 ( specifically EPA, minimum 1000 mg EPA per day) supplementation for depressives. The best source of omega 3 seems to be fish oil. Has anyone here taken fish oil capsules for a length of time? Indeed, @anilbp:disqus I have also read about this. Have not tried it out myself nor have read a first person account of anybody who has thus benefited. @disqus_XpsaSmpGb7:disqus, how is your husband now? Not heard from you in a long time..